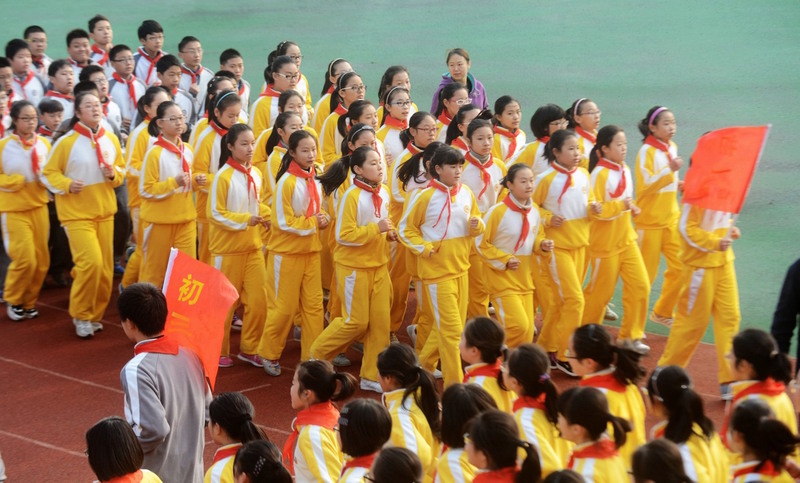 Over 1,000 students take their morning run on the athletic track at the Meiling Middle School in Yangzhou, Jiangsu province, November 26, 2014. Morning exercise at schools across China is believed to benefit students physically and mentally. Chinese are known for recycling, and recycling everything. The industry is even responsible for making billionaires, like China’s “wastepaper queen” Zhang Yin. Yet when factories recycle irresponsibly, the consequences can be dire. Reports of dozens of schools where children have fallen ill with bloody noses and nausea have been making national headlines for the past few weeks. The culprit appears to be industrial rubber waste that has made its way into schools via the synthetic surfaces of the schools’ athletic running tracks and playing fields. In the CCTV report above (one of a two-part series in Chinese), reporters visited the No. 6 Elementary School in Pinggu in northern Beijing. The track and field that had just been completed there in May was cordoned off with tape, warning students not to enter. Its strong smell already ensured people wouldn’t want to get anywhere close. Prior to this, the school reported that 25 students had nosebleeds and many others suffered nausea, headaches, allergic reactions, and other symptoms after exercising on the track. In many of the classes, as many as a third of the students were absent due to sickness. CCTV reporters snuck into one of the plants that supply a lot of the raw materials that end up becoming the synthetic playing fields for many of Beijing’s schools. The scene is horrifying. The plastic and rubber pellets that are a key component of the synthetic tracks and fields come from toxic recycled rubber and other trash sourced from pipes, electric cables, trashed tires, and industrial tubing that may carry traces of toxic substances. According to the CCTV report, corner-cutting halved the money it takes to build a synthetic track but raised the risks of health hazards. Though the school’s records of the construction showed all the required permits were obtained and safety standards met, one of the subcontractors, Mr. Zhang—captured on a stealth camera by CCTV—said he has been in the business for years but does not go to the construction sites himself, out of fear of their toxicity. “How is it possible that these fields don’t end up poisonous?” Zhang asked, rhetorically. After an indoor air quality test commissioned by the local government raised suspicions, parents hired a Shenzhen firm to conduct an independent assessment. The results of the two tests were vastly different. Among the 16 rooms tested by the Shenzhen firm, all showed levels of formaldehyde higher than the accepted safety level. The worst were those in a music classroom, where the Shenzhen firm found the level of formaldehyde to be 2.283 milligrams of formaldehyde per cubic meter (mg/m3), but the government tests of the room reported levels of 0.2 mg/m3. The national standard is 0.1 mg/m3. The China Youth Daily report found that the parents’ version of testing adopted two latest procedures published in 2011 and 2014 and the government testing used a 1995 methodology. School officials questioned the parents’ version of testing, saying that “it didn’t have a stamp from a national testing service.” Yet an education official from the Xicheng district government asked the school to suspend use of the music classroom and renovate it to meet air quality standards. The parent-commissioned testing also found other toxic substances present at levels above those considered safe, including polycyclic aromatic hydrocarbons and short-chain chlorinated paraffins, which according to the China Youth Daily report are potentially harmful to the kidney, liver, and brain. This won’t be the last story involving parent-school tensions over health safety. The summer seems like a good time for schools nation-wide to address safety concerns and to do their best to provide a safe environment for their students when they return in the fall.